As a video production company, Nicolettecinemagraphics is always looking to explore new videographer tools. 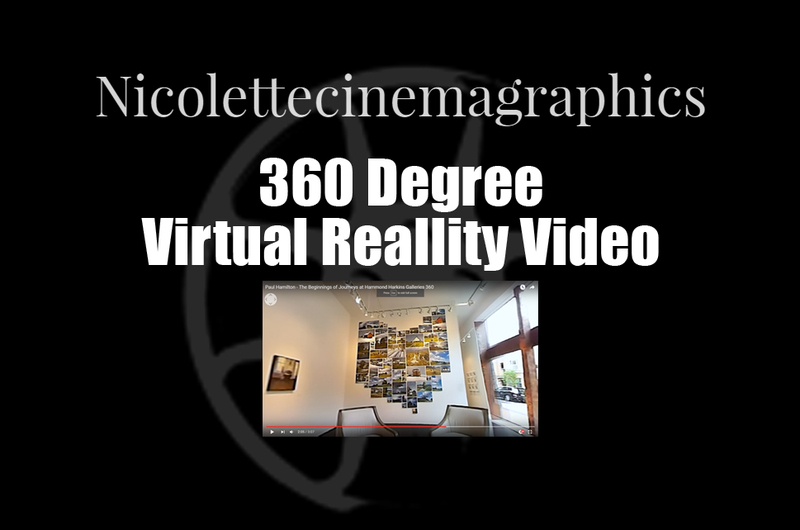 We are proud to announce the addition of 360 degree virtual reality video for youtube and other applications to our videography arsenal. What is a 360 virtual reality video? These videos use special camera rigs to capture video in a spherical form which is played back by applications that put the viewer in control of the world in the video. Imagine standing in a room, in a forest, or on beach and looking around in all directions so you can see the sky above you, the ground below you, and turning your head to see every angle. This is what a 360 virtual reality video provides. The technology lets viewers interact with these videos in a few different ways such as 360 VR software that allows you to view and interact with the videos on your computer, streaming video applications that you either interact with video through swiping or using the gyro features of your mobile device, or using a VR goggle apparatus such as google glass which you strap over your eyes like a pair of goggles immersing you in the video experience. Check out one of our recent 360 virtual reality videos made for Hammond Harkins Galleries in the Columbus, Ohio featuring a solo exhibition of art work by Paul Hamilton.